Hi, documentary club, thanks for coming back to discuss Dust to Glory. If you haven't had the chance to see it yet, you can watch it here. Those who stand on the sidelines love to pontificate about the higher meaning of competition. "It's not about a race," director Dana Brown narrates at one point in his 2005 documentary Dust to Glory, "it's about the human race." Which, fine, that certainly sounds nice. But for the actual athletes, competition isn't some big cosmic event: it's a collection of fleeting, intensely personal experiences that arise when emotion, stamina, and drive all intersect. Most competitions last mere minutes or a few hours at most, rarely sustaining the same level of intensity for their entire duration. 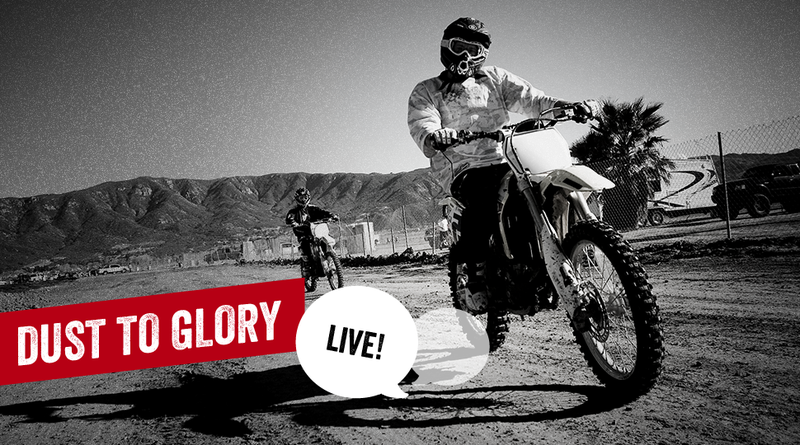 But imagine racing a motorcycle at 110 mph across treacherous terrain for 32 hours straight. The annual off-road Baja 1000 race is a real brain-breaker in that sense. It's kind of hard to appreciate the grand significance meanings of competition when you're white-knuckling it between cacti at 4am, you know? By no means is Dust to Glory a perfect documentary: it's not the handsomest production nor the best-filmed, but these shortcomings can be attributed to an honestly rendered present-tense production (i.e. nothing seemed to be re-staged for our benefit). As far as providing a thorough, thoughtful examination of an admittedly nightmarish event, it's hard to ask more of this film. And let's be real, some of that immersive footage (including some stunning helicopter work and of course McCall's frightening crash) is truly remarkable. The film's aggressive insistence on getting impossible shot after impossible shot keeps it in line with the ugly vehicular beasts it documents. Broken fenders, tattered tires, and filthy windshields aside, it crosses the finish line like a champ. So how did you feel about Dust to Glory? Let's talk about this thing! 1. Forget the bikers: what kind of death wish do these spectators have, anyway? 2. Um, did I imagine this, or did a racer really get knocked off his motorcycle by one of the documentary's camera helicopters? 3. More than one driver has admitted to seeing strange lights in the sky. Please discuss. 4. "There's a good reason the name Andretti is synonymous with speed. Because it's synonymous with speed." Brilliant narration or brilliant narration? 5. Which vehicle would you prefer to race: motorcycle, trophy truck, buggy, or Beetle? 6. Wait, is this race about the human race after all? What else occurred to you while watching Dust to Glory? Let's talk it out! For more of all things Netflix, visit netflix.kinja.com.